Calling all Shutterbugs! Enter our Photo Contest! The above photo was sent to us courtesy of Robert Beyer from the Hobby Greenhouse Association, and it is an excellent example of a greenhouse photo to be submitted to our Greenhouse and Garden Photo Contest. 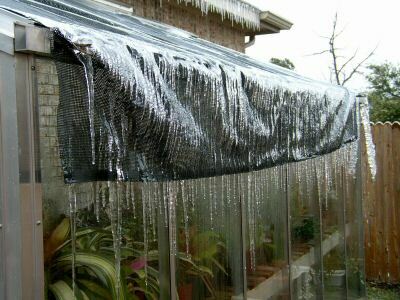 This sample photo is not an entry to our contest, and Bob writes "This was from the ice storm we had in Austin this winter. Thank God for a hobby greenhouse!" Most gardeners anxiously await Spring, the official start up of another gardening season. This year, we are kicking off the gardening season with our first annual Greenhouse and Garden Photo Contest. If you are lucky enough to have your very own backyard greenhouse, now is your chance to show us your stuff! For those of you who do not yet have your own greenhouse, you are welcome to submit a photo of your garden, or one of the prize possessions that you have grown. Send your photo to us along with a brief description prior to the May 31, 2007 deadline. Photos will be shown on our web site, www.backyardgreenhouses.com and each photo will receive an entry for the winning prize. The winning prize will be drawn on June 1, 2007. If you have purchased your greenhouse or greenhouse gardening supplies from us, receive a bonus entry by sending us a testimonial along with your photo. Participants may enter more than once, provided a different image is entered with each photo submission. Photos may be featured on one or more websites, e-stores, catalogs, publications or promotional materials belonging to Ecolad Corporation. The original photographer retains all copyright and we will always credit the photographer with each use. Photos must be original and unpublished. Each participant entering the contest, acknowledges having read these rules and regulations and agrees to be bound by them and all decisions of the contest organizers, which shall be final. Send us your photos today, and remember to send us your testimonial for an additional entry. If you require additional information, please call toll free 1-800-665-2124.